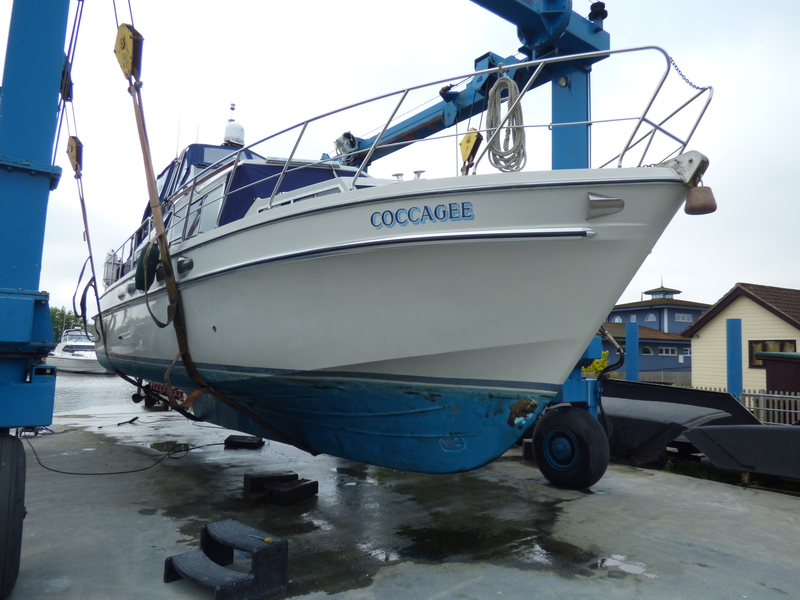 We recently carried out a Pre Purchase Inspection on this Ocean 37 c 1978 fitted with a pair of Perkins HT6.354 diesel engines on conventional drive propulsion. The styling and layout is very much a trademark of the Aquafibre / Broom Boats amalgamation back in the 70’s & 80’s. With easy stern access from the flybridge, nice wide decks all round and very comfortable accommodation. Getting on for 40 years old they are still a very popular and sought after vessel and make a reasonably comfortable sea boat. 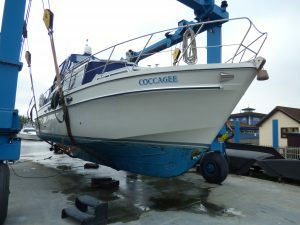 This Ocean 37 is well built and despite her age and being currently moored in fresh water exhibited no visible signs of osmosis, though it is thought she may well have had an osmosis treatment at some point in her lifetime. Inside, the accommodation is well presented. Entering the vessel from the stern you step down into a well laid out saloon / living area which also makes into a double berth. From here you can then step down into the galley, aft or forward double cabins. Both cabins have their own WC and shower. The whole accommodation area is both light and airy with good visibility. The decks are nice and wide and you feel very safe with her having stanchions and rails around the outer edge of the decks. Twin v-berths in the forward cabin and two singles in the aft cabin provide permanent berths for four, whilst the settee in the saloon converts to another double berth. 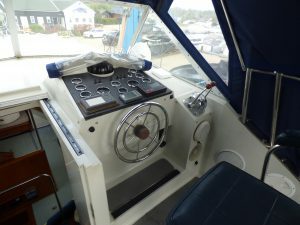 All boats feature interior and exterior helms and have sliding doors on both sides of the saloon giving access to the side decks. Power is provided by twin 145hp turbo-charged Perkins 6.354 diesels. This was a very well presented vessel which over the past 40 years had been reasonably well maintained. Seacock Valves: Servicing & 2x J-clips fitting. Fuel System Installation: Improve access to fuel tanks, filler and vent pipes. Bilge Pump: Confirm operation of the Bilge Pump. Batteries & Battery Boxes: Secure the batteries within their compartments. Fire & Safety: General maintenance plus install a Carbon Monoxide Alarm.